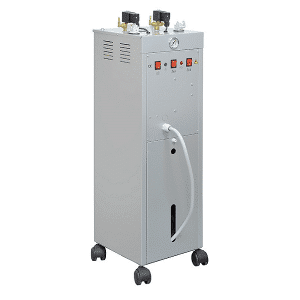 Steam boilers with irons available with steam capacities of 2.5 litres and 5 litres. Lelit electric steam boilers are available with a commercial steam iron and are perfect for getting professional ironing results. Made from long lasting stainless steel. Lelit boilers are easy to maintain even in hard water areas because they are simple to rinse them out. 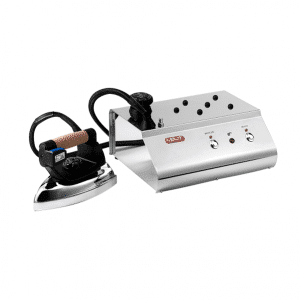 Buy Lelit PS25 steam boiler if you are ironing for only a few hours per day. The 2.5 litre steam capacity generates a powerful jet of steam for up to 2 and 1/2 hours. It also comes fitted with the Lelit PG036/7 steam iron. 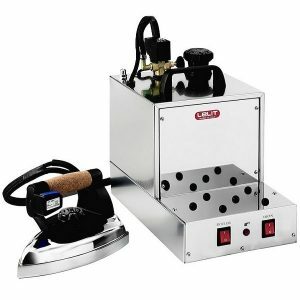 Order the Lelit PG027 steam boiler for continuous ironing of up to 4 and 1/2 hours. Also, it comes complete with a Lelit PG036/7 steam iron. Choose the Lelit PGAUTO5NEW automatic boiler for continuous ironing. Ideal for busy laundries, dry cleaners and ironing services who iron all day and don’t want any down time. Connect the Lelit PGAUTO5NEW to your water supply for automatic refill. In addition, power two steam irons with this boiler.